Biodiesel Market Size Is Likely To Reach A Valuation Of $54.8 Billion By 2025: Grand View Research, Inc. The global biodiesel market is expected to reach USD 54.8 billion by 2025, according to report by Grand View Research, Inc. Growing requirement for biofuels owing to their environment-friendly characteristics is anticipated to propel market over the forecast period. According to a report by published by Grand View Research, Inc.; the global biodiesel market is anticipated to value USD 54.8 billion by 2025. Growing requirement for biofuels owing to their environment-friendly characteristics is anticipated to propel market over the forecast period (2018 to 2025). Biodiesel reduces greenhouse gas emission better than fossil fuels. This factor is anticipated to bode well for product demand in near future. Rising adoption of biodiesel attributed to its ability to support existing engine designs in automobiles can augment market in the forthcoming years. In addition, supportive initiatives from governments across various nations to reduce Volatile Organic Compound (VOC) emissions and dependency on crude oil can positively influence market expansion. Moreover, increasing use of renewable energy resources owing to increasing threat of fossil fuel depletion is anticipated to fuel market growth during the forecast period. The worldwide biodiesel market can be segregated on the basis of feedstock, application, and region. Based on feedstock, the market can be categorized into vegetable oils and animal fats. In 2016, vegetable oils dominated the market and accounted for around 90.9% market share. Technology knowhow by majority of manufacturers and high oil yields offered by biodiesel can augment growth over the forecast period. Canola oil, soybean oil, and corn oil are likely to be major feedstock used for production of biofuel. Animal fat based biodiesels is likely to expand at a CAGR of 7.4% from 2017 to 2025. 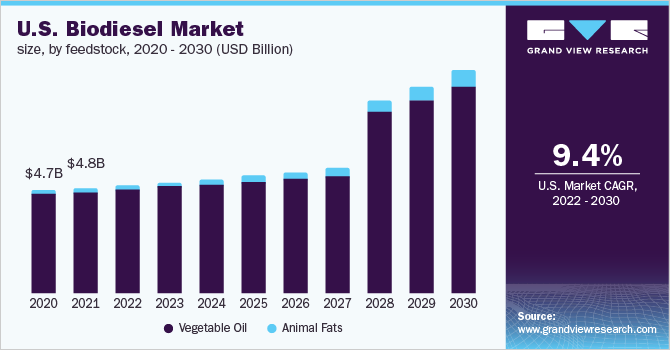 Growth in animal slaughtering coupled with low cost compared to vegetable oils is predicted to have positive impact on feedstock segment growth in near future. Based on application, the market for biofuels can be classified into fuel, power generation, and others. In 2016, the fuel segment dominated the global market and accounted for around 75% market share. High demand for bio-based fuels over crude oil in commercial cars can augment demand. In addition, biodiesel is beneficial for environment as it can reduce the effects of greenhouse gas by emitting low VOC contents as compared to traditional diesel. Similarly, marine segment is predicted to register a CAGR of 8.4% from 2017 to 2025 as biodiesel is biodegradable, free of aromatics and sulfur, and is anti-toxic. Furthermore, rapid growth coupled with high mechanization in agriculture can drive product demand in agricultural applications during the forecast period. Moreover, power generation segment is anticipated to expand at a steady CAGR over the forecast period. Growing adoption of renewable sources of energy to generate power and to reduce greenhouse gas emission can fuel market growth. Regional segmentation includes Europe, North America, Asia Pacific, Central and South America, and Middle East and Africa (MEA). Central and South America is expected to expand at a fast CAGR of 11% from 2017 to 2025. Favorable initiatives taken by governments of Colombia, Brazil, and Argentina can promote biodiesel adoption to reduce fossil fuel imports. This factor is anticipated to propel regional expansion over the forecast period. In Asia Pacific, India is predicted to be one of fastest growing markets attributed to rising demand for diesel driven vehicles. Government initiatives to promote green fuels over crude oil and to reduce pollution can augment regional market for biodiesel during the forecast period. In addition, government of India’s plan to blend 5% biodiesel by 2022 is anticipated to further impel growth over the forecast period. In China, Used Cooking Oil (UCO) is expected to be primary feedstock used for manufacturing of biodiesel. The country is expected to have 25 bio refineries using UCO as their raw material. Majority of Used Cooking Oil Methyl Ester (UCOME) produced in China can be used for industrial application, which is expected to account for 50% of overall consumption. Fishing equipment and agriculture are expected to be second largest application sector for biodiesel in China and can account for around 15% of overall demand. Europe is projected to be the third largest market for biodiesel attributed to early adoption of the product. Shifting government focus on replacing carbon emitting sources with bio-based products can fuel regional market. In addition, soybean oil, animal fats, rapeseed oil, UCO, and sunflower oil is expected to be common feedstock used for manufacturing biodiesel. 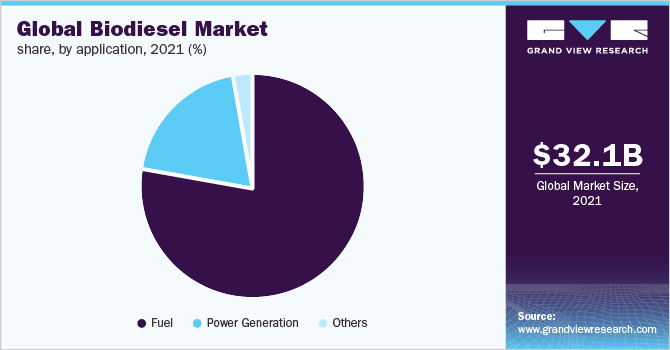 Some of the leading companies in biodiesel market are FutureFuel Corporation; Renewable Biofuels, Inc.; Wilmar International Limited; Bunge Limited; and Louis Dreyfus Company.